It’s Channukah, which means it’s time to eat lots and lots of latkes. 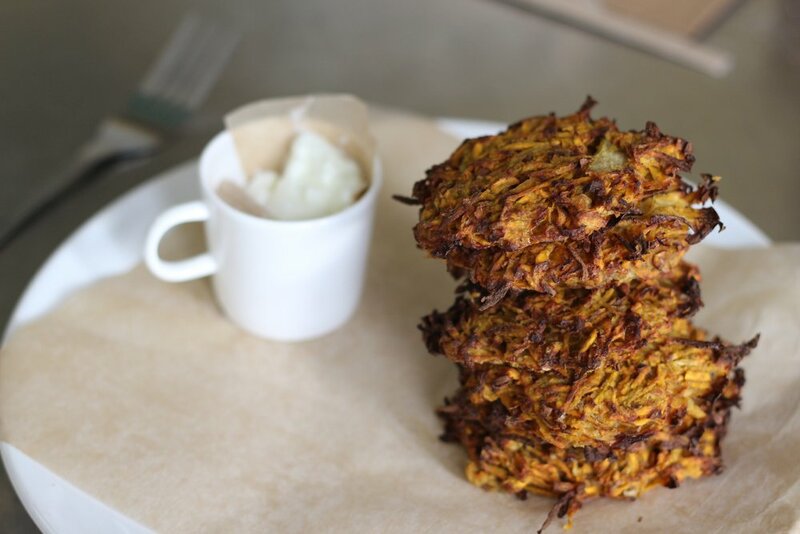 These deliciously, Jewish savoury treats are also known as potato pancakes and they are a must this time of year. Traditionally, latkes are made with white potatoes, white flour and are fried in lots and lots and lots and lots of oil. While they taste oh-so good, they aren’t terribly healthy and they often lead to bloated, gassy bellies….yuck. We have updated bubby’s recipe and come up with our own minor spin on the traditional to bring you healthy, delectable and crispy latkes for your enjoyment. Not only do we have the recipe for you – but we also have a quick 25 second video on how to make the perfect, modern latke! Rinse your sweet potatoes and grate them. If you have a food processor I highly recommend using the grating option, it saves a lot of time. Leave the skin on, not only does it add extra fiber but it also gives your latke a crispier texture. Place the shredded sweet potato in a bowl and then shred your onion. Place your shredded onion in a strainer or a cheese cloth and strain out the excess liquid. Add the onion to the sweet potato. In a separate bowl, crack 2 eggs and whisk. Then whisk in 1/4 cup of gluten free flour and 1 tsp of sea salt. Place the wet ingredients into the dry ingredients and mix around until the sweet potatoes and onions are well combined with the egg mixture. Form into latkes using your hand or a cooking scoop. Place on a tray lined with parchment paper. Once the latkes are laid out, brush olive oil over the tops to allow for extra crunch and crisp. Bake in the oven at 375 for 15-20 minutes. Allow to slightly cool and serve with sheep or goat yogurt. Sheep or goat yogurt have a slightly tart taste that compliments these sweet latkes really well.